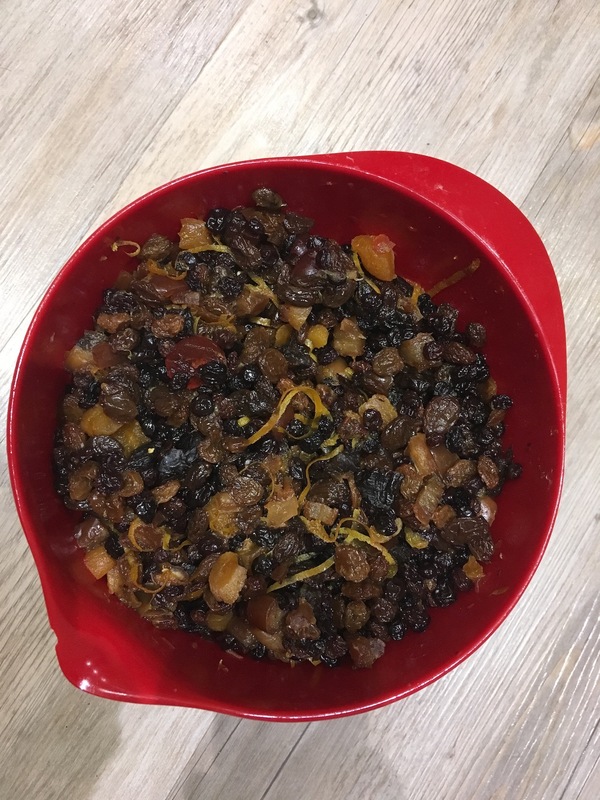 Christmas 2018 – Christmas Cake! 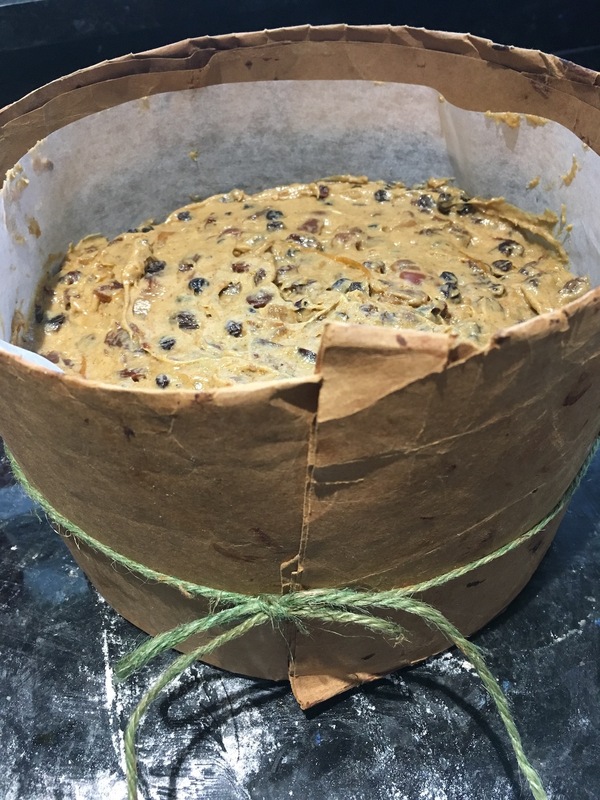 I love this Christmas Cake recipe – I have used it every year since my mother in law used it for our wedding cake nearly 10 years ago. when you are ready to finish the mixture and bake the cake, put the soaked fruit in a sieve over a bowl and drain the left-over brandy out, then put it in a jam jar. beat 4 medium eggs into a separate small bowl. add a spoonful of egg and a spoonful of flour / spice mix to the bowl with the beaten sugar and egg in, beat until fluffy – repeat until there are no eggs left. If the mixture curdles and starts to separate, add another spoon of flour and beat it harder! stir in 1 large tablespoon of molasses or black treacle and the drained fruit, the mixture will be really stiff and heavy by this point. 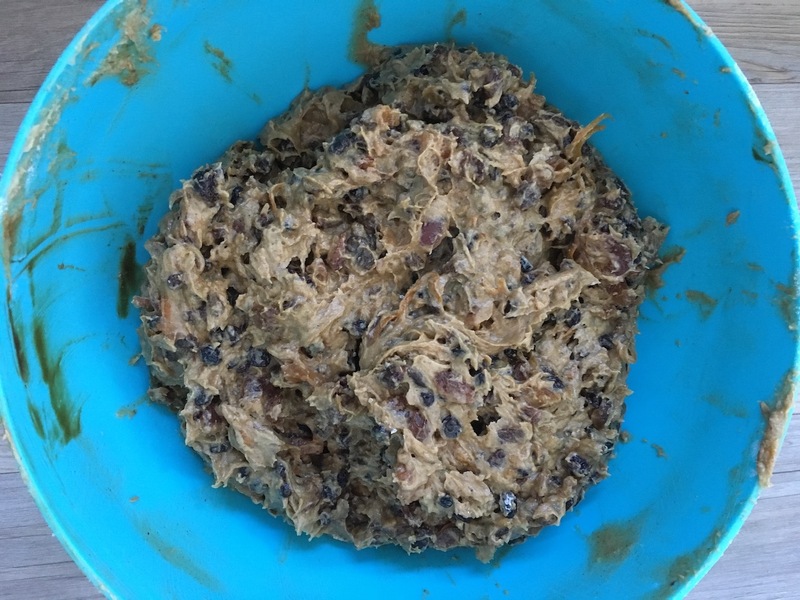 By the end of the recipe, the cake mixture will be really thick and heavy – start with a large enough bowl! spoon it into the lined tin, smooth the top, wrap the tin in brown paper to prevent the edges of the cake burning. Cook for approx. 4hrs at 120°C or until a skewer comes out clean with no crumbs stuck to it and the edges of the cake have moved inwards slightly away from the tin. Leave it to cool in the tin before turning it out. Wrapped cake ready to go into the oven. once the cake is cool, stab it all over with the skewer and ‘paint’ some of the left-over brandy all over the cake. Wrap the cake tightly in a layer of greaseproof paper and a layer of tinfoil and put it in a tin out of the way until you are ready to marzipan and ice it (I usually end up doing this in a mild panic on Christmas eve) If you remember, unwrap the cake, stab it and paint some more brandy on it a few more times to ‘feed’ it before you decorate it. Decorating the cake! Knead 1 ½ blocks of marzipan (or 2 if you like a really thick layer of marzipan!) and roll it out, I roll out a circle shape for the top of the cake and a long rectangle for around the sides, paint the cake with leftover brandy and stick the marzipan down. If you are efficient and organised, leave the cake somewhere cool for a day or so to let the marzipan harden slightly, if you aren’t and are doing this in a panic on Christmas Eve, don’t worry and just put the icing on top straight away. I use Delia Smith’s royal icing recipe and then decorate it with appropriate Lego! 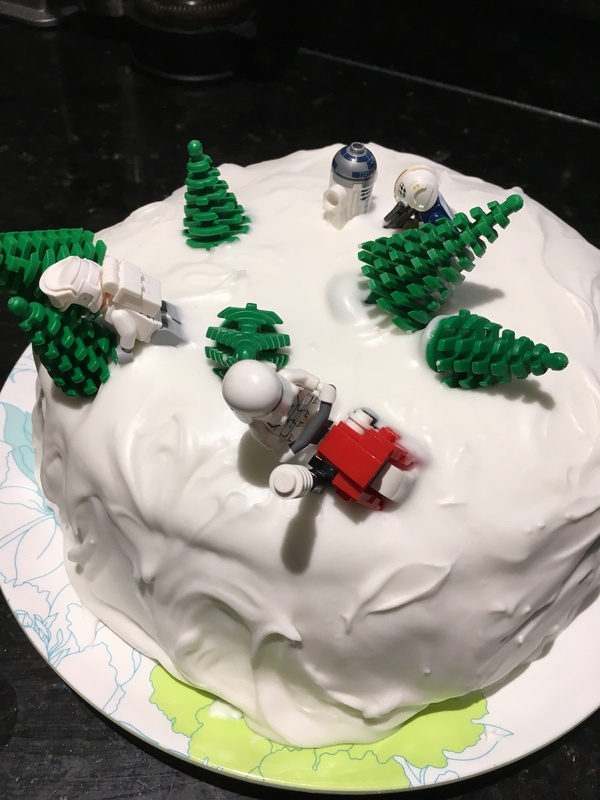 Last years cake, decorated with Lego trees and Stormtroopers, I’m not very good at Royal Icing so it wasn’t quite stiff enough and slowly avalanched off the cake along with the decorations – hence the erratic angles of the Stormtroopers!